BIG BITE APRIL NEWS LETTER - Big Bite Baits, Inc. When the bass start to hit the beds in your favorite lake or river what Big Bite Bait do you reach for? If you took a poll I bet the answers would be across the board, but tearing it down there are a few that come to mind that would rise to the top of the list, WarMouth, Tube Bait and a Drop Shot. Let’s look at these three baits and the tactics behind fishing them for early season spring time bass. 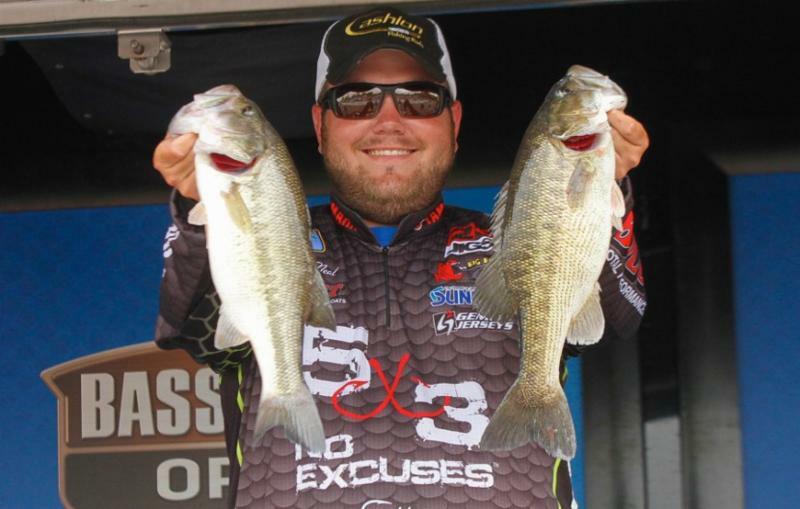 If I was a betting man my money would be on Big Bite Pro Dean Rojas that when faced with sight fishing bedding bass this is the bait that Rojas will have tied onto the end of his line. He has proven it time and time again that the WarMouth is his sight fishing go to bait of choice. In fact if I remember right he has cashed a few checks using the WarMouth in a few situations when fishing the Elites in just the last few years. There is a connection between the bass and bluegills that makes this combination work so well. Bluegill are an enemy to the bass especially when the bass roam off of their nests. Bluegill many times will rush in and start to eat the bass eggs or new fry so bass will work to keep the bluegill away from the beds once the new eggs are laid or hatched. If fact if you get a chance to see bluegill raiding an abandon bass nest they will turn on their side and flap their tail to get the eggs to come up with the silt from the bed then they turn around and start to eat the suspended eggs with a few passes. So it is not uncommon to see bass go after gills that get close to the nest. Looking at how Dean rigs the WarMouth, you have a perfect imitation of what a bluegill looks like on its side heading into a nest to go on a raid. Dean rigs his WarMouth on a Gamakatsu 3/0 EWG worm hook and teams this with a weight to match the conditions that Dean is fishing, he rigs his WarMouth on its side to imitate a gill on its side raiding a bed when pitched close to or into a bed. Intentions are the bass will strike this bait for any reason once it sees the bait, I have seen bass come after this bait when it is not even close to the bed just to strike the bait out of spite thinking it is killing a bluegill that could cause harm to its nest. Cast or pitch the WarMouth, you can pitch the WarMouth if you see a bed or you can blind cast the WarMouth to cover water if you do not see a bass bed, whatever way you want to fish it the WarMouth is a bait to have tied on when the bass start to hit the shallows for the spawning season. Know as one of the first true bait to fish when the bass started to spawn, the tube for many years was just that, only fished when the bass started to hit the beds. The tube has a unique fall that would circle its way down to the bass causing strikes from bass sitting on beds above them as the bait started to fall. 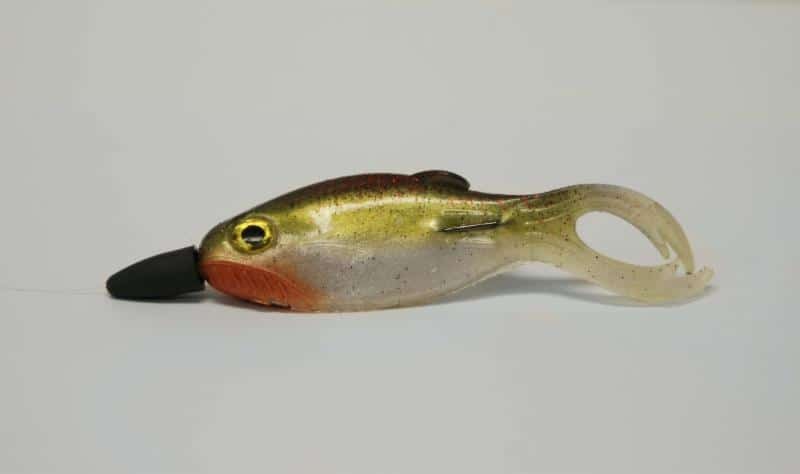 If you underweight the tube it would stay in the strike zone longer and if you needed a faster fall you could up size the weight of the jig you were using to get a straight fall from the bait, however you choose to fish it, the tube can flat out catch spawning bass. For a long time bass fishermen would throw a tube in the spawning season and put it away for the rest of the season, now bass fishermen have found that the tube is more than just a bait to use when bass hit the beds. 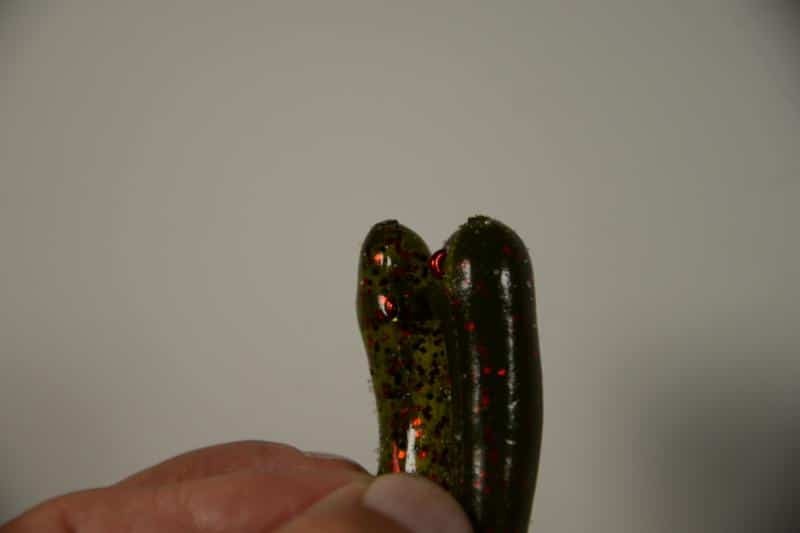 By changing the eye position of your jig you can made the tube do a few different things. When using a 90 degree eyed jig the tube will fall in a tight circle over a bass that is sitting on the bed, another tip go on the light side when picking a weight, the lighter the jig that you pick the slower the fall triggering more bites in your day of fishing. If I see bass on the beds this is my tube rigging of choice. In between beds I will make a slight change I will use a 60 degree eye jig for a search bait. This rigging will have a larger circle fall and will cover more water when looking for beds or roaming bass. If I see a bass on a bed it is a quick switch to get to the other tube and back to work. For the majority of the time I will fish tubes on a spinning setup, 7ft medium action rod teamed with a matching spinning reel that is spooled with 8lb to 10lb Sunline Sniper. If I am fishing around allot of cover I may opt to go to 12lb to 14lb Sunline SX1 braided line or I may grab a baitcaster that is spooled with 16lb Sunline Sniper line. I let the cover dictate the setup choice that I fish. Over the years drop shots have been mainly used for a deep water tactic, but in the last few years it has started to catch on when fishing for bass that are on the beds. That is for one simple reason, you can keep the bait in front of the bass for a great amount of time, and this will help you trigger strikes from the most finicky bass that you can encounter. Rigging for this spawning drop shot is no different than the other except for the fact that you may want to up the poundage of the line you are using when fishing around cover other than that it is the same. For me I generally up my line size from 6lb to 10lb. I can get by with this line size the majority of the time, in the case I think I need more I may opt to use a7ft medium action rod teamed with a matching baitcaster reel that has 12lb to 14lb test line. One change I do make is the hook that I use for this setup. I am a firm believer in using the Gamakatsu Swivel Shot G-Finesse Hook Drop Shot setup in deep water, but when fishing a drop shot in the spring I opt to use a Gamakatsu Finesse Heavy Cover hook. This way I can bury the hook into the offering that I am fishing making it more weedless when around cover. 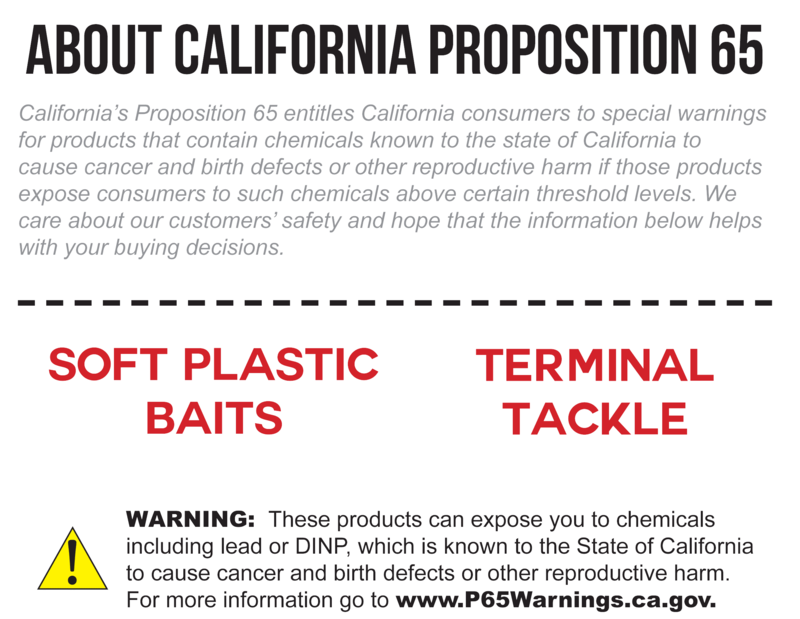 When it comes to baits that I use I will have a few laid out on the deck of the boat, 4″ and 6″ Shaking Squirrel and the new 3.75″ jointed minnows are first to come to mind. 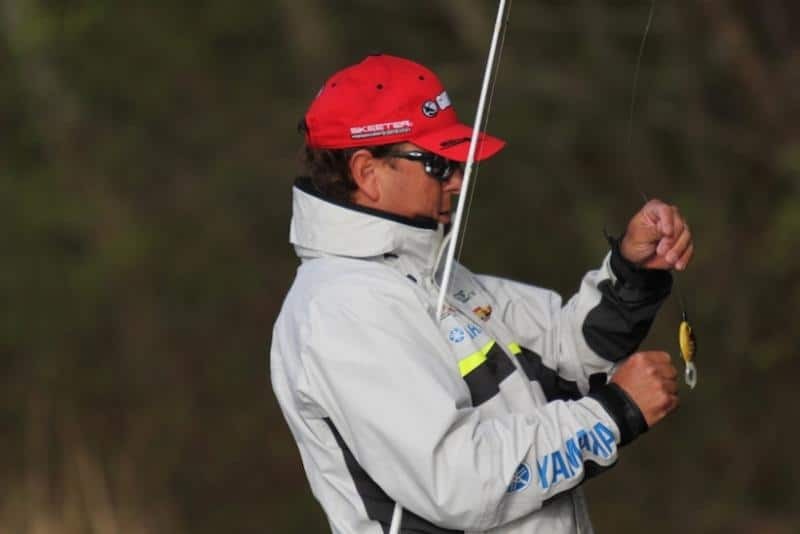 If I am looking to fish my drop shot in a wacky presentation I will opt to use a 4″ Trick Stick. 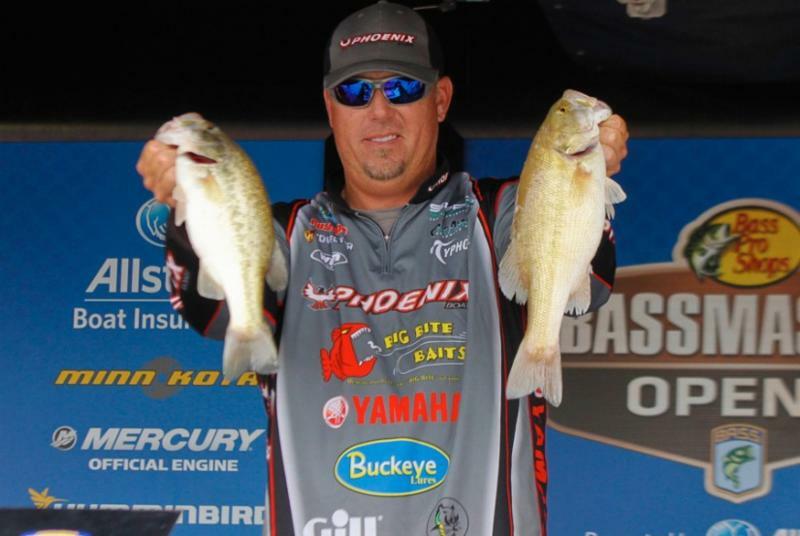 Storming into the 2nd stop of the season on the Alabama River Big Bite Pro Russ Lane and Michael Neal finished in the Top 10. Russ earned a 7th place finish and Michael Neal took 9th place. Congratulations.